Gavi almost made the charts back in the hay day of Italian whites such as Soave, Castelli Romani and Frascati. I remember a lovely seafood lunch on the patio of a Soho restaurant – when it was to ‘coolest’ area in NYC, washed down with gallons of Gavi. “I going to Gavi more often” were my thoughts that day, but I soon forgot thanks to the Chardonnay invasion, the Sauvignon tsunami, and Italy’s new star, Pinot Grigio. 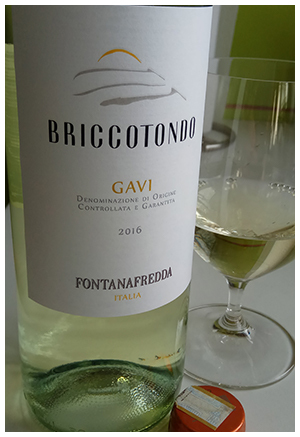 Gavi is similar to Pinot Grigio as in light, low flavour and no oak, but it has a classier feeling – hard to describe, but think jazzy sports car over crowdpleasing Honda Civic. The first sip delivers a ‘swoosh’ and if you’re not smartly dressed, you’ll wish you were. Gavi with Summer patio lunches is something I’m certainly looking forward to. Gavi more often at last! P.S. Fontanafredda’s Barbera Briccotondo (#372987 $14.95) is a natural follow-on red. It’s lively, tasty with a happy summer feeling. Lightly chill.